Be Happy Pie Company is excited to bake for brides and grooms. Call us at (812) 449-7718 to schedule a tasting or to ask about pricing. We'd love to help make your wedding day or bridal shower one to remember! 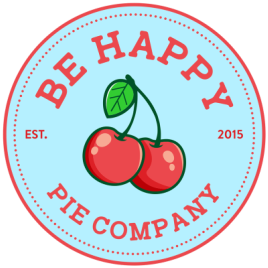 To guarantee Be Happy Pie Company can fulfill your holiday orders, please order 1 week in advance to ensure you have your delicious 'Be Happy' Pies to enjoy with family and friends. Due to high volumes at holidays including Thanksgiving, Christmas, Easter, Mother's Day, and Father's Day, orders placed after the 1 week deadline cannot be guaranteed. Order early, stay happy! Be Happy Pie Company has the perfect dessert for your company's event. Whether it's for a business meeting or your company's annual picnic, 'Be Happy' pies are sure to please. We will even deliver for a small fee. 'Be Happy' Pie Bites and Pie Poppers are also a unique gift for customers and vendors. Call us at 812-449-7718 to discuss how we can help with your next event. Open every Saturday (9 a.m. - 1 p.m.) May 25 - August 31, 2019. Located at the Carnegie Library on Franklin Street. For those who wear their 'Be Happy' hats and tees at these events, enjoy one free 'Be Happy' Pie Bite on us!